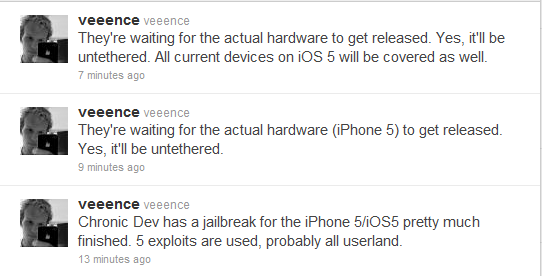 The Chronic Dev Team has announced that they've found 5 userland exploits in iOS 5 making it very likely that an untethered jailbreak will be available for the upcoming firmware. P0sixninja made the announcement at MyGreatFest, an iCommunity and Jailbreak convention currently being held in London, England. While this is a "record breaking number of exploits found", userland exploits can be easily fixed via a minor software update. By keeping the exploits secret, the Chronic Dev Team is hoping that Apple won't fix them before the expected iOS 5 launch next month. Notably, if the exploits are still present in iOS 5 when it releases, this will bring a jailbreak to the iPad 2 once again.